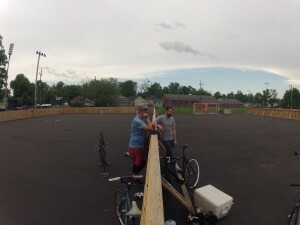 Lexington is home to the very first city parks-sanctioned hardcourt bike polo courts in the U.S. The two fully equipped polo courts were initially built in 2009 by the hardworking members of Lexington Bike Polo, and are continually improved each year, making Lexington a desirable location for large tournaments. Each court conforms to the size regulations mandated by NAH. The perimeter is sealed with tall dasher boards and a surrounding chain-link fence to prevent the ball from exiting the court. Lights illuminate the courts during nighttime hours, allowing for play at any time during any season. Are these courts still used frequently and is there a schedule? I am curious if a group of kids could play some street hockey there. Thanks!